These quotes about friendship can paint a picture of what it’s like to have true friends. Read the insights from great writers and leaders. Please take your time with the quotes below. Enjoy the insights on one of the most important relationships in our lives: friendships. We have few friendships, because we are not willing to pay the price of friendship. Golden friendship is not a common thing to be picked up in the street… There are pearls of the heart, which cannot be thrown to swine. Uproot thou hatred’s plant completely, or woes unnumbered thence may shoot. It is a friendly heart that has plenty of friends. Quotes about friendship make great additions to friends’ birthday cards, notes, letters, texts and emails. Share with your friends how you value their relationship. Once let friendship be given that is born of God, nor time nor circumstance can change it to a lessening; it must be mutual growth, increasing trust, widening faith, enduring patience, forgiving love, unselfish ambition—an affection built before the Throne, that will bear the test of time and trial. As strong in passion is, though not so gross. O Friendship! thou divinest alchemist, that man should ever profane thee! Pure friendship is something which men of inferior intellect can never taste. Who talks of a common friendship? There is no such thing in the world. On earth no word is more sublime. Friendship is the nearest thing we know to what religion is. God is love. To the young friendship comes as the glory of spring, a very miracle of beauty, a mystery of birth: to the old it has the bloom of autumn, beautiful still, but with the beauty of decay. A garland sweeter than the banquet’s rose. Quotes life encourages us to learn – being able to quote appropriately is the sign of an educated person (some say). And free from clouds, design, or flattery. Poets and friends are born to what they are. Judge before friendship, then confide till death. The highest friendship must always lead us to the highest pleasure. Hand grasps hand, eye lights eye in good friendship, And great hearts expand, And grow one in the sense of this world’s life. How it gives the heart and soul a stir up! As mountain-baths to wild fowls in their flight. The essence of friendship is entireness, a total magnanimity and trust. It must not surmise or provide for infirmity. It treats its object as a god that it may deify both. Friendship is an order of nobility; from its revelations we come more worthily into nature. For perfect friendship it may be said to require natures so rare and costly, so well tempered each, and so happily adapted, and withal so circumstanced that very seldom can its satisfaction be realised. Happy is the house that shelters a friend! It might well be built like a festal bower or arch, to entertain him a single day. The moment we indulge our affections, the earth is metamorphosed: there is no winter, and no night: all tragedies, all ennuis vanish; all duties even; nothing fills the preceding eternity but the forms all radiant of beloved persons. Love shows me the opulence of nature, by disclosing to me in my friend a hidden wealth, and I infer an equal depth of good in every other direction. Friendship demands a religious treatment. We must not be wilful, we must not provide. We talk of choosing our friends, but friends are self-elected. Reverence is a great part of it. Oh, be my friend, and teach me to be thine! My friends have come to me unsought; the great God gave them to me. A man’s friends are his magnetisms. Therefore I value your friendship. Quotes about friendship can take several directions: warm, inspirational, appreciative and more. Pick the right friendship quote for your need. 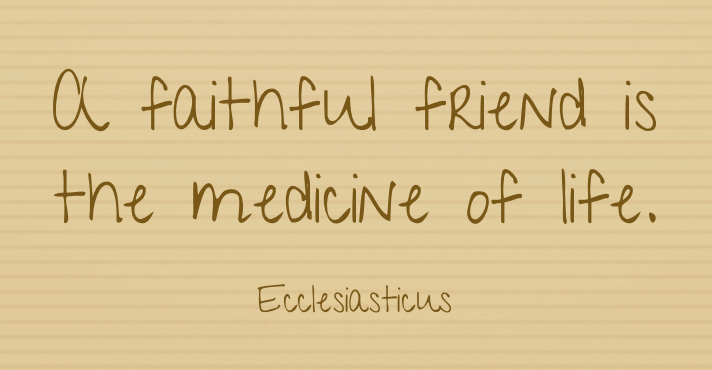 Friendship sealed by companionship in sin will not last long. Who friendship with a knave hath made is judg’d a partner in the trade. Friendship requires a steady, constant, and unchangeable character, a person that is uniform in his intimacy. Eschew that friend, if thou art wise, who consorts with thy enemies. They seem to take away the sun from the world who withdraw friendship from life. Real friends are our greatest joy and our greatest sorrow. Friendship is the ideal, friends are the reality; reality always remains far apart from the ideal. Friendship or Love draws freshly forth. To have a friend is to have one of the sweetest gifts that life can bring: to be a friend is to have a solemn and tender education of soul from day to day. Friendship always benefits, while love sometimes injures. Friendship is an allay of our sorrows, the ease of our passions, the discharge of our oppressions, the sanctuary to our calamities, the counsellor of our doubts, the clarity of our minds, the emission of our thoughts, the exercise and improvement of what we meditate. He who has a thousand friends has not a friend to spare, But he who has one enemy will meet him everywhere. A friend who will not despise us for our weakness, nor disown us for our sinfulness, nor tire of us for being troublesome, nor scoff at us for our sensibility, but who will patiently hear our tale, fully understand our regret, tenderly recognize our stumbling-blocks, and be honest enough to tell us the truth, cost us what it may—oh, do you not see what a real help he might be to us. A friend welded into our life is more to us than twice five thousand kinsmen, one in blood. A friend loves to see you happy. I have made it a rule never to be with a person ten minutes without trying to make him happier. Looking for something on the funny side? Try our humorous friends quotes. I used to think that friendship meant happiness: I have learnt that it means discipline. Dear is my friend – yet from my foe, as from my friend comes good: My friend shows what I can do, and my foe what I should. Love is flower-like; Friendship is like a sheltering tree. You shall perceive how you mistake my fortunes; I am wealthy in my friends. In friendship, there is no commerce or business depending on the same, but itself. I can never think of promoting my convenience at the expense of a friend’s interest and inclination. If you have any suggestions for the quotes about friendship page, please let us know via the contact us page. Thanks! Looking for more friendship quotes and sayings? Check out our Friends Quotes.